This report analyzes data from UK-company kMatrix and presents major findings on market size and employment. It also looks at the contribution of each ECO Canada sub-sector to Canada’s GDP. 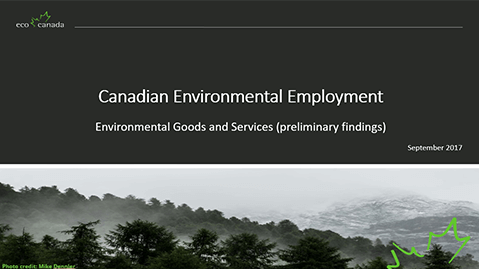 The Canadian environmental goods and services sector. In 2015, an estimated 44,800 companies were in this sector with sales of over US$132 billion. The Energy sector. Much of Canada’s environmental goods and services comprise companies operating in the renewable energy sector, which had sales of $59.8 billion in 2015. Employment. The energy sector is also the highest employer with 640,000 employees in renewables and efficiency sectors.